On a day when 13 different players caught a pass from Colts quarterbacks, one couldn’t help but be impressed with the young skill players at the receiver position. Rookie receivers T.Y. Hilton and LaVon Brazill tied for the team lead with three catches apiece on the afternoon. “It felt great to come out there and compete not only with your teammates, but against other players,” Brazill said. “I felt comfortable, it was fun out there.”Brazill made three pretty impressive catches all for first downs against the Rams and was the Colts kick returner. The ability to get the ball in the hands of Brazill and Hilton has been emphasized all through training camp. Along with his own three catches, including a spectacular sideline grab for a first down, Hilton also returned punts and even had one carry for nine yards. Harnish has seen the talent of his fellow rookies since they were drafted back in April. In working through minicamps and now into training camp, Harnish has developed a solid rapport with many of the Colts young receivers and that showed on Sunday. Early in the fourth quarter, Harnish threw a beautiful 33-yard touchdown pass right into the arms of wide receiver Jeremy Ross to make the score 35-3. Ross spent a majority of his rookie season in the NFL on the Colts practice squad and knows the difficulty of a crowded and talented position. The receiving corps showed its potential throughout all four quarters on Sunday and is expected to be a competitive battle for the rest of camp. It’s plays like the one Ross made in the fourth quarter that will keep him noticed and he knows in order to keep fighting for a spot on the opening day roster, he must continue to do the little things. There was another rookie quarterback that excelled on Sunday for the Indianapolis Colts. Chandler Harnish completed all three of his passes against the Rams including leading the offense on a pair of fourth quarter scoring drives. A Fort Wayne, Ind. native, Harnish put on a nice show for some friendly faces in the crowd on Sunday. Harnish entered the game early in the fourth quarter and wasted no time leading the offense down the field. After four runs by Deji Karim to start the drive, Harnish capped it off with a beautiful throw to wide receiver Jeremy Ross. Working against man coverage, Ross beat his man on the outside and Harnish placed the ball perfectly into his receiver’s hands for the 33-yard touchdown. During training camp, Harnish has had a number of highlights with the deep ball and he added another one on Sunday. Following the touchdown, the Colts defense forced a three-and-out and back came Harnish on the field for another scoring drive. This time the result was a seven-play drive that was capped off with a 31-yard field goal by Pat McAfee. The final drive for Harnish was a simple knee as the offense finished the afternoon with double the total offense of the Rams and was an impressive 11-of-15 on third down conversions. There was no drop off from quarterback to quarterback throughout the afternoon for the Colts. From the first unit to the last, the agenda remained the same with Harnish leading the offense just like his fellow rookie quarterback had done in the first half. “Our goal as a third string unit, especially with the score the way it was and the field position we had, was get a score. Whether it was a touchdown or a field goal, get a score,” Harnish said. When we last spoke with Colts rookie running back Vick Ballard, he was trying to stay focused mentally despite limited reps in a crowded backfield. If his first carries in the NFL are any indication, Ballard will be earning more time on the field in practice and less time on the sideline. Ballard entered Sunday’s preseason opener with the St. Louis Rams late in the first half. The Colts were already up 21-3, but the Rams had just pinned them deep in their own end after an outstanding punt. With the ball resting in the shadow of their own goal post and less than two minutes remaining until halftime, the coaching staff just needed the offense to hold on to the football and at least give punter Pat McAfee enough room to get a kick away without allowing the Rams to gain any momentum before the half. New offensive coordinator Bruce Arians entrusted Ballard with that responsibility and Ballard responded with three tough runs for 27 yards before the gun sounded. Ballard’s runs not only got the Colts out of harm’s way deep in their own territory, they were enough to cause the Colts to use a timeout and at least ponder one more shot at scoring. Ballard admitted he had a few butterflies entering the game in such a precarious position, but once he got the football, his instincts took over. Ballard said that he didn’t really see anything Sunday that he wasn’t prepared for. For that, he gave all the credit to the coaching staff for preparing them so thoroughly. He did, however, notice an immediate difference in the kinds of hits given out in the NFL compared to what he got in college at Mississippi State. Ballard finished the day as the Colts’ leading rusher picking up 28 yards on six carries for a 4.7 yards per carry average. He also made a nice shoe-top grab of a Drew Stanton pass in the flat that picked up 11 yards. While the day’s attention was primarily focused on the auspicious debut of the other Colts rookie in the backfield, Vick Ballard more than held his own at a critical juncture in the game. Ballard hopes that performance will cause his coaches to take notice as he battles for a roster spot. In the meantime, he’ll continue to study and focus and await his next opportunity next Sunday in Pittsburgh. Quan Cosby has been the quiet man among Colts wide receivers thus far in camp. In Sunday’s preseason opener against the St. Louis Rams, he let his play on the field speak loudly for him. Cosby has taken somewhat of a back seat thus far in Colts camp, content to let the media focus on veteran returning stars like Reggie Wayne and Austin Collie, or young rookie hopefuls TY Hilton and LaVon Brazill. Sunday, Cosby stood out among the receivers and also showed he can contribute on special teams. Cosby caught three passes Sunday for 44 yards, just a yard less than Austin Collie. He only wishes his signature catch of the day, a 32 yard reception from Andrew Luck where Cosby ran free down the seam of the Rams Cover 2, had gone a yard further. Cosby was touched down at the one yard line where Delone Carter would eventually go in for the Colts third touchdown of the first half. He would catch two more balls in the second on three targets. He also was back in single safety to return punts on two occasions, neither of which presented an opportunity. Cosby was very complimentary of his rookie quarterback after the game. Last year, Cosby began the season in Cincinnati and watched Bengals rookie Andy Dalton develop. He sees a lot of similarities between Dalton, who guided the Bengals to the playoffs as a rookie, and Andrew Luck. If Cosby can continue to show the ability to stretch the field as a receiver and be a dependable special teams contributor, he could begin the 2012 season the way he did 2011, helping a rookie quarterback lead his team to the playoffs. What’s up Colts Nation!? Well, it has officially began, the highly anticipated Indianapolis Colts “new era” is officially underway and man it feels good to be a Colts fan! Now before I get into yesterday’s game, I realize it was a preseason game, and I realize that in years past these games haven’t exactly mattered to a majority of you. However, preseason games do serve a purpose and when you look a Colts team that has a lot of young and new players you realize the importance of this year’s preseason. In addition to that, preseason games allow for coaches to evaluate every position, tells them where they can improve, and sets the tone for the next week of camp. But most importantly, we won, and I think every single member of Colts Nation feels better about this team today than they did yesterday. All the anticipation was worth it and now we get to watch this team grow. The team we saw on Sunday will not be the same team we will see this weekend against the Steelers. They will improve. This team will continue to improve every game and that is something both players and coaches will pride themselves on. And how about Andrew Luck’s first play ever from scrimmage as a Colts? You want to talk about COTLSTRONG, Lucas Oil Stadium was rocking after Luck completed a 63-yard touchdown pass to running back Donald Brown! I’m not going to lie; I got goose bumps when I saw them connect and instantly knew Brown was taking it to the house. What a way to kick-off a season and especially a career. 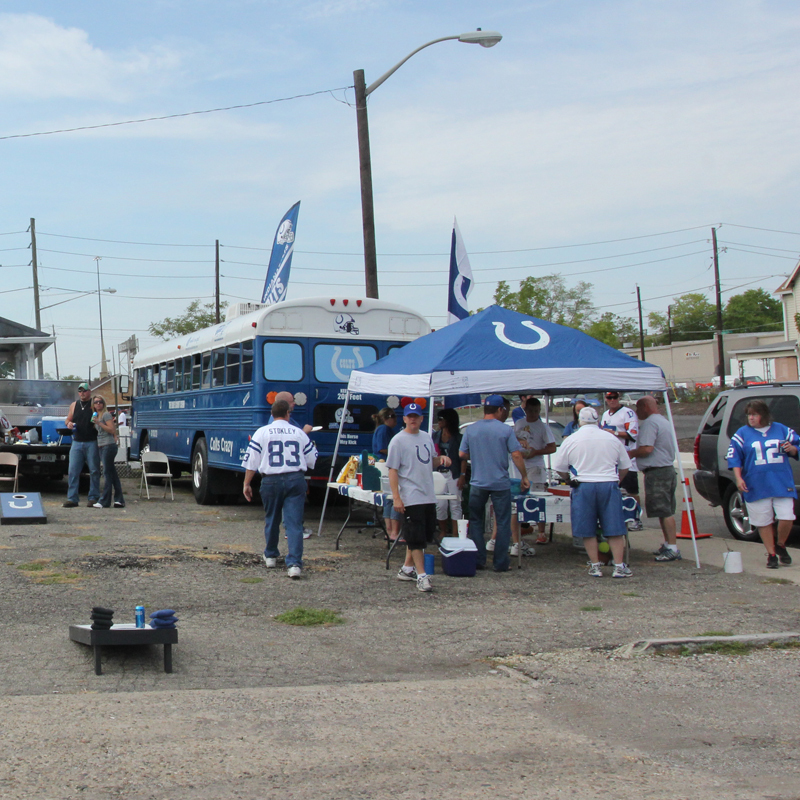 Prior to the game, I hit up a few tailgating spots. For it being a pre-season game I was pretty impressed with the turnout. 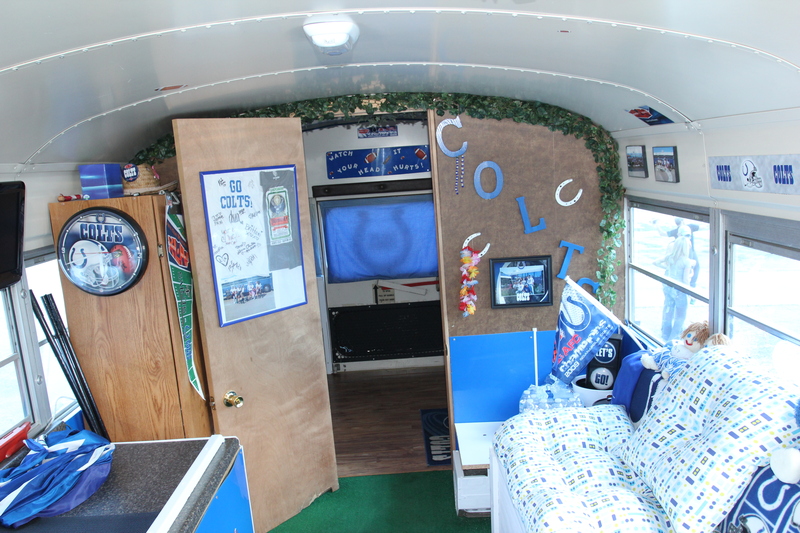 One of my favorites was the “Blue Scoot Crew” who had a Colts bus with memorabilia all over the place. They even had a built in restroom which of course was covered in blue. 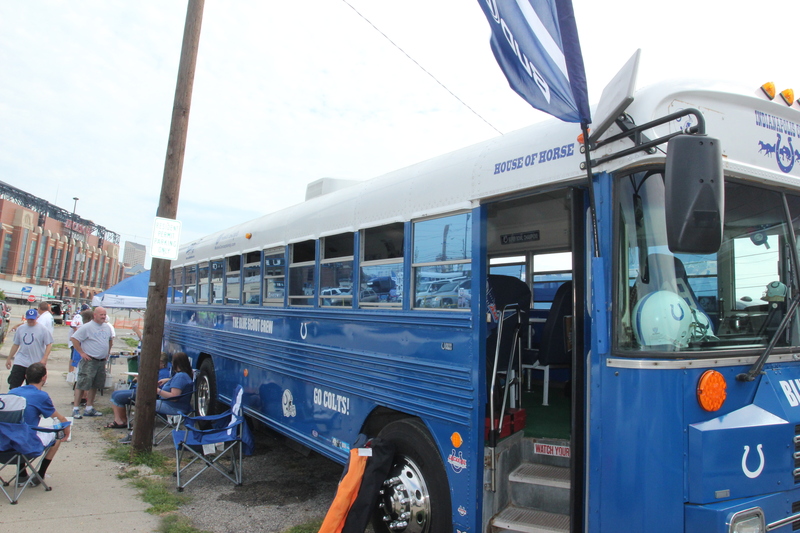 Before every game this season, I will be searching for the best tailgate spots and food in all of Colts Nation. I will write a blog this week with complete details. Well that’s it for today. Be sure to check back to my homepage on Colts.com for more information and follow me on Twitter to chat it up!